With your participation and support, you become an intricate part of helping to change the lives of the current and future women and children that we serve. 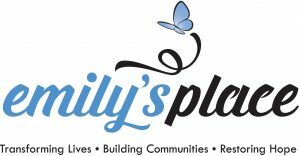 Emily’s Place is a transformational ministry that allows women and their children to stay up to 24 months. Our ministry promotes stability and wise choices. Our residents are women and children who have survived domestic violence. Our program includes counseling, weekly case management, and life-skills development– all within a structured environment. We are the bridge from the shelter back into the community, ensuring that the families we serve become fully functioning members and contributors to the communities in which they live. Registration: 9:00 A.M. / Shotgun Start: 11:00 A.M.